Recently, Matthijs wrote a blog that serves as a primer as to what makes for the best practices when building an unattended battery based energy system. As pointed out in that blog some of these systems are large scale containerised systems. In that blog we also asked for your own examples and suggestions when building such systems, so we can add to the knowledge base of what makes a good system. One such example has been submitted by Jacques Noël (Victron Energy Sales Manager, France) on behalf of ERM Energies for a solar powered containerised system, which is due to be utilised by the Red Cross in Burkina Faso. Here are the details of that system. 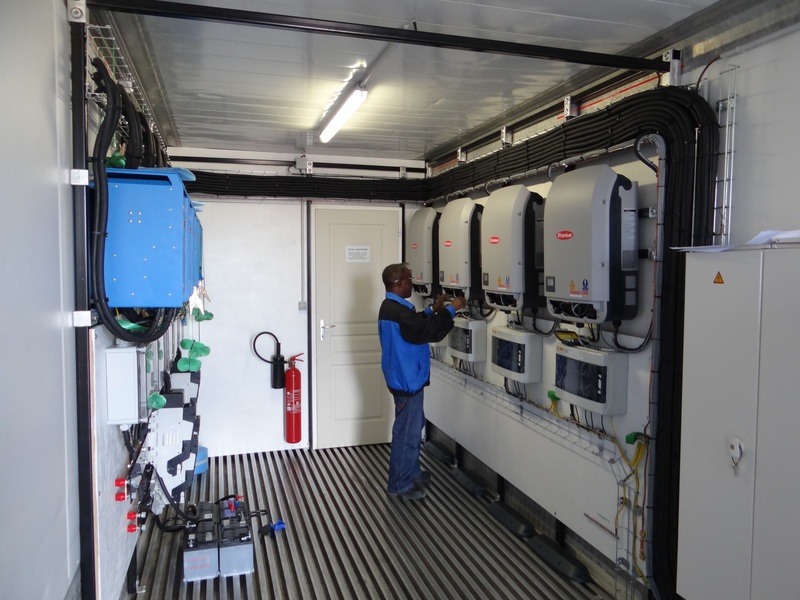 The Monaco utility company SMEG had the great idea of recycling the Milan 2015 Universal Exposition containerised energy system into a complete training facility for the Red Cross in Loumbila. Victron Energy customer ERM Energies were appointed as the project leaders for this, as a subcontractor to Ineo Green. 50 kWp of solar is to be installed on carports on site to improve the power supply, as the local grid is weak and not particularly robust. A diesel generator is also planned. 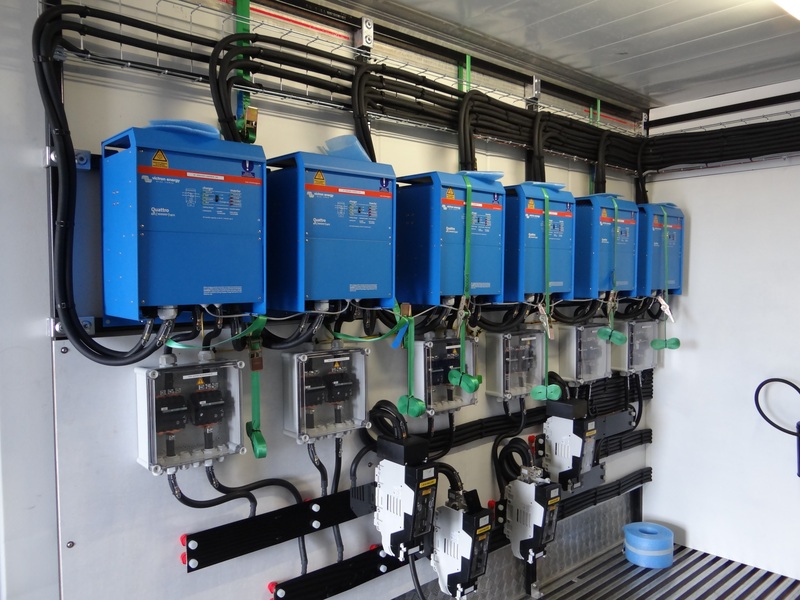 ERM Energies, under Olivier Krug’s supervision, designed and built this containerised 50kW mini-grid system based on 6 x Victron Energy 48/10000 Quattro inverter/chargers (wired for 3 phase operation) and 4 x Fronius SYMO 12.5 3 phase grid inverters. The system includes a 48V 4000Ah OPzS battery bank in a separately vented area within the container. DC high power distribution is via copper bus bars. A number of features were also added to ease the use of the system, including the ubiquitous and internet connected Color Control GX for remote monitoring and control. “We had a chance to design smart integration structures for all the equipment that needed to fit inside the container. In fact we have also made these our standards for other similar projects, such as three desalination units for Mauritania which are due to be completed shortly. The system has now been delivered to Loumbila and is planned to be operational in January 2017. My thanks to Olivier Krug of ERM Energies for the information and images used in this blog. ERM certainly seem to have given their technical best to the project and the fact that the project carries so much social impact is laudable. If you have a similar project that can add to and enhance the knowledge base of what it takes to build a quality unattended battery based energy system, do let us know in the Disqus comments section below.